Can My Dog Eat Penut Butter? Does your dog magically appear in the kitchen every time you open up the peanut butter jar? You are not alone. Most dog owners give their dogs peanut butter from time to time, and this nutty treat does indeed drive dogs nuts. It can be spread inside hollow bones and toys for a long-lasting treat, or just licked from a spoon or finger as a quick reward. From a health perspective, however, there are a few peanut butter facts you need to be aware of before you let your pup clean out that empty peanut butter jar. Most peanut butter is safe for dogs to eat, and in moderation peanut butter can be an excellent source of protein and healthy fats, vitamins B and E, and niacin. The healthiest option is unsalted peanut butter or homemade peanut butter, as high sodium levels can be problematic for dogs, and as an added bonus, homemade peanut butters do not contain extra sugar and other additives. How Much Peanut Butter Can Dogs Eat? Peanut butter is rich in natural fats and protein, but too much of a good thing can lead to obesity and other health complications like pancreatitis. 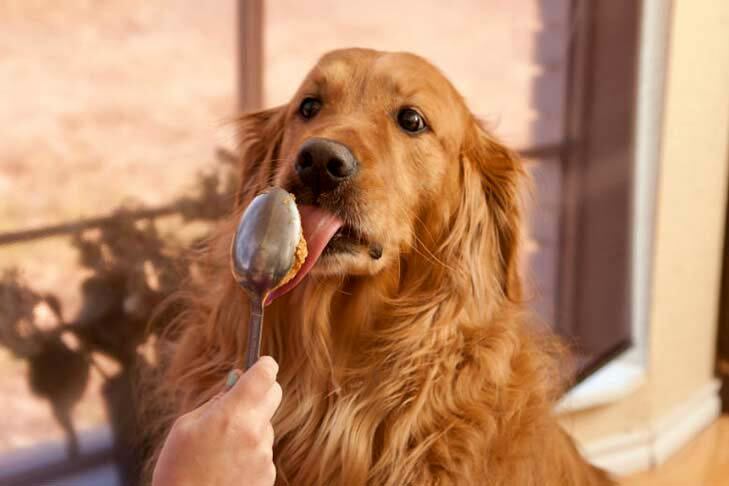 There are two things you can do to figure out how much peanut butter to feed your dog on a regular basis. The first and most reliable option is to call your veterinarian and ask his or her advice. This is especially important for owners of dogs with conditions such as diabetes or with food sensitivity issues. The second option is the 10 percent rule. In general, treats should not make up more than 10 percent of your dog’s diet. Simply measure how much food your dog gets daily, and remember that it might be a good idea to alternate between peanut butter and healthier treats, such as dog friendly fruits or vegetables. Most peanut butter is safe, but some can be deadly. Recently, some peanut butter manufacturers switched to using the sweetener xylitol. Xylitol is a sugar substitute often found in sugar-free products like chewing gum, toothpaste, breath mints, chewable vitamins and baked goods. It is safe for people, but toxic to dogs. Xylitol consumption causes a rapid release of insulin in dogs, which results in an equally rapid and profound decrease in blood sugar levels. and can be life threatening if left untreated. This condition, scientifically known as hypoglycemia, can occur as quickly as 10-to-60 minutes after eating xylitol. Xylitol poisoning is easy to avoid. All owners need to do is check the label of the peanut butter and any other product they plan on feeding to their dogs for xylitol, and keep xylitol products out of their dogs’ reach. If you think your dog has eaten xylitol, contact your veterinarian immediately, and keep an eye out for symptoms of xylitol poisoning, such as weakness, collapse, staggering, lack of coordination, and seizures. Don’t keep your pup in suspense any longer. Yes, dogs can eat peanut butter as long as it is fed in moderation and does not contain xylitol, so get out that peanut butter jar and share the good news.